Take Five for Dignity & Respect Month: Share a Video! Dignity & Respect Tip 20 is: SHARE YOUR POINT OF VIEW!This Dignity & Respect Month we are asking you to create a D&R video and encourage your colleagues, contacts, Facebook friends, and twitter followers to share their stories. Two winning video(s) will be selected for D&R Month October 2012, one for the most number of Facebook “likes” and one for most YouTube “views” for the month. Each winner will receive a $1,000 D&R Visa gift card! All you have to do is Take Five! Be creative and include your friends and colleagues in your video! Make sure your videos are no more than 2 minutes long and do not include explicit language or expressions. “I’ve taken the D&R Pledge to treat everyone deserves dignity and respect. Have you?” Learn more at www.dignityandrespect.org/DRmonth or www.facebook.com/dignityandrespectcampaign. 4. Encourage your friends to “like” your facebook posting or view your D&R video on YouTube video. 5. Winning videos will be featured on the Dignity & Respect Campaign website and Facebook page for up to one year! So get inspired and share your message of Dignity & Respect with us! October is Dignity & Respect Month. All month long, we want all our fans and followers to help us spread a message of Dignity & Respect. Help us reach our goal of reaching 50,000 Facebook Fans by sharing our Dignity & Respect pledge with your friends, coworkers, and family. 1. Just by becoming a Fan of our Facebook Page, your voice becomes part of a chorus of supporters of Dignity & Respect. Share our page with you Facebook Fans and get the word out! 2. Send a message with our Animal App and you can cheer up you friends while spreading awareness of Dignity & Respect. 3. Sign the pledge directly on our website! Why not get your coworkers to sign the pledge around the lunch table? Just log in and add your name to our supporters! So what are you waiting for? Become a supporter of Dignity & Respect today. It is just that easy! 1. Share the Pledge. Get your friends, family and coworkers to sign our Dignity & Respect pledge! Help us get to 50,000 Facebook Fans this October by sharing our page and using our Dignity & Respect animal app to spread messages of Dignity & Respect. 2. Shoot a Video. Do you have a message of Dignity & Respect to share? We want to hear it. We will ask you to answer a question about Dignity & Respect. 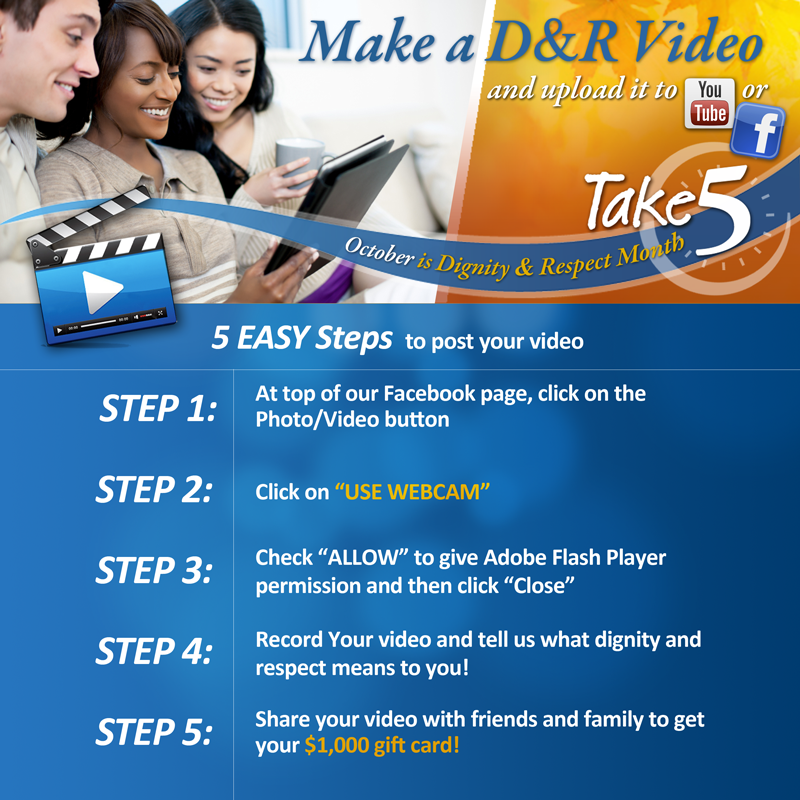 Create a video and you could win a special D&R prize! 3. Promote Our Proclamation. Would you like your town, county, or school district to declare October Dignity & Respect Month? We will give you the tools to let your community know that you believe in Dignity & Respect for all people. 4. Nominate a Champion. Do you know someone who represents the principles of Dignity & Respect. Send us a photo and explain why your hero is a Dignity & Respect Champion. 5. Take Our Survey. We want to know more about you and how issues of Dignity & Respect influence your life. Share your experience with us! It is going to be an exciting month! We hope you celebrate with us all month long! Did you know that July is National HIV Awareness Month? 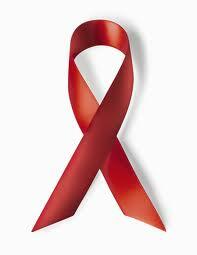 HIV is not just a disease the affects a certain demographic or people just in the developing world. It impacts all of us. Let us spend this month assisting efforts for a cure while continuing to treat all people with Dignity & Respect. Congratulations to Dr. Magi Berger, April’s Dignity & Respect Champion! Every morning at Clairton Elementary, students listen to five of their peers state over the loud speaker how they are going to practice dignity and respect that day. After just one year as principal, Dr. Magi Berger has instilled the values of inclusion into the school, and they are reflected all day, every day. “From bully behavior, to poverty, to abuse and neglect, and many other trials that life is full of for our students, it becomes even more important to role-model dignity and respect. We as educators are positioned to influence so many lives. Each time we take such opportunity we are that much more likely to be the special person in their lives that they remember long after schooling. We may be that voice in their minds pushing them toward greatness or helping them make it to college, trade school, or beyond,” said Dr. Berger. As a resident of the North Hills, Dr. Berger came to Clairton Elementary after working at Pittsburgh Public Schools. 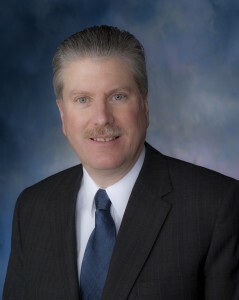 Since becoming principal, Dr. Berger, staff, and faculty have adopted “Dignity & Respect for Everyone and Everything” as the school’s theme, and promote it on report cards and newsletters. Through contests and ceremonies the students are rewarded for good behavior and grades with cupcake parties and t-shirts. Recognizing the significance of simple acts of kindness, Dr. Berger offers a helping hand whenever she sees the opportunity. She believes that these actions begin with an individual and extends to others as a pay-it-forward deed. Dr. Berger feels that if everyone showed value and recognition toward each other, we can bring communities together, resulting in a more vibrant and positive home for everyone. Do you know an individual who makes a positive impact and promotes an environment of inclusion? If so, nominate the person in your life you feel has made a difference for the Dignity & Respect Champion Award!